Blessed with charismatic looks, viciously sharp fangs, and an immortal existence, vampires have simultaneously delighted and horrified for centuries—now, with the recent folkloric addition of skin that sparkles like diamonds, mere mortals don’t stand a chance! And yet, while the modern-day vampire embodies all that is dangerous but sinfully irresistible, the science behind vampire mythology is less glamorous, more gruesome, and equally as compelling. Tales of bloodthirsty, supernatural beings have existed for millennia and in nearly all cultures. Although each culture has their own variations and names for vampires, today’s iconic version originates from the early 1700s, when stories of centuries-old Balkan traditions spread to the rest of Europe.1 Historical records describe vampires as creatures that rise from their graves to feed on the living—typically their own family. Bodies were commonly buried face-down, so that vampires would dig themselves deeper instead of clawing their way to the surface.1 Further methods to defeat vampires included the classic staking, and sometimes as extra precaution, de-fanging. A 700-year old skeleton recently unearthed in Bulgaria, found staked (piece of iron rod, pictured) and with its teeth removed. A written account from 1725, illustrating common practices of the time, details the exhumation and subsequent slaying of suspected vampire, Peter Plogojowitz.1 When other villagers began dying in the weeks following Peter’s death, local superstition demanded that his corpse be disinterred. Exhibiting all the hallmarks of a vampire, his body was barely decomposed, with newly grown hair and nails, and most terrifyingly, blood dripping from the mouth—clear evidence of recent victims. During the subsequent, required staking, more fresh blood poured from his ears and mouth, after which, his carcass was burned to ash. Today, historians and anthropologists, armed with knowledge of the normal decomposition process, suggest that early belief in vampires derived in part from a limited understanding of how bodies rot. To start, the deceased’s remains might appear unblemished—even healthier—given that accumulating gases can fill out a starved frame, and decomposition rates can vary wildly with environmental conditions.1 The illusion of continued growth in hair, nails, and teeth occurs as the surrounding skin and gums retract with dehydration.1 As for the most unnerving mark of vampirism, the “fresh blood” seeping from the nose and mouth, it’s actually a natural byproduct of decomposition, called purge fluid.1,2,3 Furthermore, when purge fluid moistens a funeral shroud at the mouth, it could cause tears that appear as though the vampire is chewing at the cloth.2 Even reports that vampires shriek and moan as they are staked, can be explained by the expulsion of gases that collect within the body cavity.1 Still more, in some cases (including that of Peter Plogojowitz), cadavers with sustained erections—a nod to vampires’ purported sexual voracity—can occur with bloating of certain organs.1 Taken together, it’s easy to see how the natural-but-macabre facts of death and decay could be mistaken for something more fantastical and sinister. In parallel, the vampire legends can also be explained by the coincidence of vampire hysteria with infectious disease outbreaks. In the case of tuberculosis, suspected vampires just had the unfortunate distinction of having died first; when their surviving (and infected) relatives began to weaken and die too, it was thought that the corpse had risen, returning to kill its family.4 In fact, archaeological excavation in Connecticut recently unearthed ‘vampire’ remains from the 19th century; one such skeleton (with signs of tuberculosis) had been dismembered and rearranged in a ‘skull and crossbones’ configuration—another common folk remedy for vampirism.4 In the Balkans, periods of vampire slayings were similarly concurrent with rabies epidemics.5 Like vampires, rabid humans also display certain traits such as frothing/salivating at the mouth, hypersensitivity to stimuli (e.g. garlic, light), hypersexuality, aggressiveness, and most importantly… a proven inclination to bite people.5 But while these theories do a convincing job of reducing scary Old World vampires to mundane, germ-ridden plague carriers, it is certain that the image of the modern vampire (powerful, with a sensitive-but-tortured soul) will still persist. For one thing, today’s vampires are decidedly too good-looking to be considered as diseased. Two ticks, before and after feeding. Although there are more than a million species of insects and arachnids, only 14,000 species are capable of utilizing blood as a food source.7 This suggests that digesting blood is a physiologically demanding process, and requires evolution of specialized adaptations.7 In addition to the various anti-coagulants8,9 and vasodilators10,11 in their saliva, blood-feeding arthopods have also developed elaborate systems to manage and degrade heme, a cytotoxic byproduct of hemoglobin breakdown.7,12,13 And while vampires might be able to master heme detoxification, even supernatural creatures are subject to the sobering physical constraints of a purely liquid diet. By the nature of its composition, blood is rather dilute and requires a high intake volume for blood-feeders to accrue the requisite nutrients. Meals then become a volume game; animals can swell up to many times their normal body size (as in the tick, above), but can also concentrate solid nutrients as they feed, by simultaneously excreting liquid waste.14 Indeed, vampire bats, unlike their namesake, have poor table manners—they usually pee as they dine.15 Mosquitoes are similarly efficient, eliminating unwanted fluids as they eat (pictured below), which has the added function of regulating body temperature.16 As mosquitoes fill with warm blood, the drop of secreted waste on their abdomen has an evaporative cooling effect; the resulting decline in internal heat protects normal metabolism, and even prevents recently-fed mosquitoes from being cannibalized by their hungry, heat-seeking siblings.16 So if nature had its way, the biologically relevant rendition of a real-life vampire would be bloated… urinating… and sweaty. No thanks! A mosquito (Anopheles stephensi ) feeds from a human host, while simultaneously excreting liquid waste from the abdomen. Disappointing physiological realities aside, the promise of immortality still explains the timeless allure of vampires. Vampire folklore adds to an age-old tradition of ascribing mystical properties to blood, in defining it as the force that sustains eternal life. In 1610, Countess Erzebet Bathory of Hungary was imprisoned for just such a conviction; legend claims that she tortured and killed dozens of girls, then bathed in their virgin blood to preserve her youth.17 Four centuries later, science has finally caught up to the ‘Blood Countess,’ demonstrating the presence of ageing and rejuvenating factors that circulate through the vasculature—in brief, blood from young animals can revitalize old animals! When first searching for these ageing and rejuvenating factors, researchers utilized a model of heterochronic parabiosis. Simply put, young and old mice are sutured together, such that they share a single vascular network. In this manner, potential rejuvenating factors in the blood of young animals disperse through shared blood vessels to the attached old animal. At the same time, possible ageing factors from the blood of old animals can also spread to the attached young animal. With this system, many age-induced physiological changes are reversed in the older mice, and in some cases, accelerated ageing is induced in younger mice. For instance, neurogenesis in the hippocampus (the area of the brain involved in learning and memory) normally decreases with age, but when old mice receive blood from young mice, they experience a recovery in the generation of new neurons!19 Unfortunately for the young mice though, pairing with older mice actually decreases their neural proliferation, which corresponds to a worse performance in learning tasks.19 Here, researchers were able to isolate the ageing factor that decreases neurogenesis in young animals.19 Other studies, instead demonstrate that rejuvenating factors from young mice can mitigate age-related changes in old mice.20,21 Most recently, old mice (when parabiotically attached to young mice) exhibit a reversal of cardiac hypertrophy, a classic hallmark of age-related cardiac problems.22 And so, in an unexpected turn of events, biology adds a layer of creepy realism to the ever-enduring, delightfully wicked, and much-loved vampire myth. Perhaps soon, science will allow us to harness the power of blood-borne rejuvenating factors, but in the meantime, just pop in your Halloween fangs, and leave the blood-feeding to the bats! Desmodus rotundus, the common vampire bat. How cute! 1) Barber, Paul. Vampires, Burial, and Death: Folklore and Reality. New Haven, CT: Yale University, 1988. 2) Dell’Amore, Christine. ‘Vampire of Venice’ Unmasked: Plague Victim & Witch? National Geographic News (26 Feb 2010). 3) Ingber, Sasha.The bloody truth about Serbia’s Vampire. National Geographic News (17 Dec 2012). 4) Sledzik and Bellantoni. (1994) Bioarcheological and biocultural evidence for the New England vampire folk belief. The American Journal of Physical Anthropology 94: 269-274. 5) Collins Jenkins, Mark. Vampire Forensics: Uncovering the Origins of an Enduring Legend. Washington, D.C.: National Geographic Society, 2010. 6) Sarkarya et al. (2012) ‘Vampirism’ in a case of dissociative identity disorder and post-traumatic stress disorder. Psychother Psychosom 81: 322-323. 7) Graca-Souza et al. (2006) Adaptations against heme toxicity in blood-feeding arthropods. Insect Biochem Mol Biol 36(4): 322-35. 8) Zhu et al. (1997) Identification and characterization of anticoagulant activities in the saliva of the lone star tick, Amblyomma amercanum (L.). J Parasitol 83(1): 38-43. 9) Figueiredo et al. (2012) Unique thrombin inhibition mechanism by anophelin, an anticoagulant from the malaria vector. Proc Natl Acad Sci USA 109(52):E3649-58. 10) Ribeiro et al. (1990) A salivary vasodilator in the blood-sucking bug, Rhodnius prolixus. Br J Pharmacol 101(4): 932-936. 11) Ribeiro (1992). Characterization of a vasodilator from the salivary glands of the yellow fever mosquito Aedes aegypti. J Exp Biol 165: 61-71. 12) Paiva-Silva et al. (2006) A heme-degradation pathway in a blood-sucking insect. Proc Natl Acad Sci USA 103(21): 8030-5. 13) Sojka et al. (2013) New insights into the machinery of blood digestion by ticks. Trends in Parasitology 29(6):276-285. 14) Vaughan et al. (1991) Concentrations of human erythrocytes by anopheline mosquitoes (Diptera: Culcidae) during feeding. J Med Entomol 28(6):780-6. 15) Milius. Vampire Reality Check. Science News (19 Oct 2013). 16) Lahondere and Lazzari. (2012) Mosquitoes cool down during blood feeding to avoid overheating. Current Biology 22: 1-6. 17) McNally and Florescu. In Search of Dracula: History of Dracula and Vampire Legends. New York, New York: New York Graphic Society, 1972. 18) Duyverman et al. 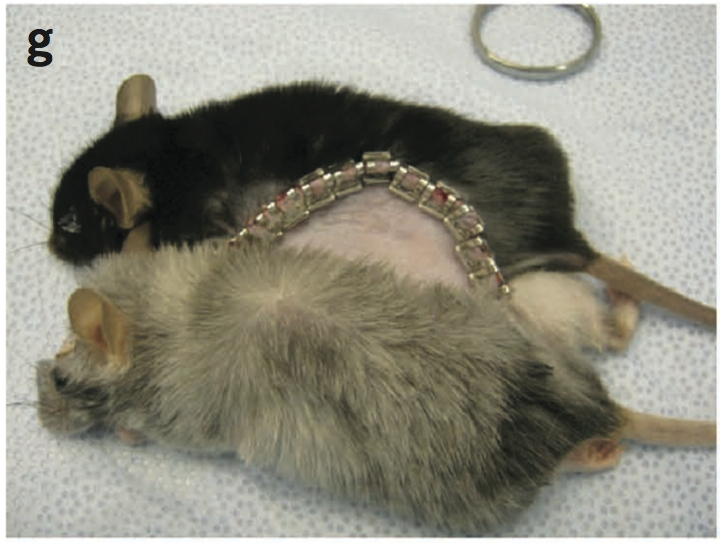 (2012) A transient parabiosis skin transplantation model in mice. Nature Protocols 7:763-770. 19) Villeda et al. (2011) The ageing systemic milieu negatively regulates neurogenesis and cognitive function. Nature 477(7362):90-4. 20) Ruckh et al. (2012) Rejuvenation of regeneration in ageing central nervous system. Cell Stem Cell 10(1): 96-103. 21) Conboy et al. (2005) Rejuvenation of aged progenitor cells by exposure to a young systemic environment. Nature 433(7027): 760-4. 22) Loffredo et al. (2013) Growth differentiation factor 11 is a circulating factor that reverses age-related cardiac hypertrophy. Cell 153(4): 828-39.